Not even on the most important day of his sports career, the Hall of Fame speech of exaltation, Dominican expeller Vladimir Guerrero changed his personality as a man of few words and great humility. During the speech he gave this Sunday in the sacred precinct of Cooperstown (New York), he recognized that reality with a big smile and showed it by speaking little. Although Guerrero has been more accessible to journalists in recent months than in virtually his entire career as an active player, with presentations in the media of his country and the United States, in the end his speech was “short”. Before a crowded outdoor ceremony, with a strong Dominican presence, Guerrero thanked God, his family and his public relations team. He gave recognition to the city of Montreal, where he began his major league career with the Expos, in addition to Canada, where he was always welcomed as a Canadian. Guerrero, who became the third Dominican to enter the Hall of Fame, expressed his gratitude with his two managers who had more time in the Majors, his compatriot Felipe Rojas Alou (Expos) and Mike Scioscia (Angels). The Dominican expelotero, who wore the cap of the Angels and in the 16 seasons he was in the majors got 449 home runs, .318 average and .931 OPS, was part along with Chipper Jones, Alan Trammell, Jim Thome, Jack Morris and Trevor Hoffman of the new Hall of Famers. Father of eight children, plus one of parenting, Guerrero could not fail to mention the fact that Sunday was the Father’s Day in his country. His great contribution to the good image of the country was recognized by the Dominican government itself that was present at the event with an official delegation to see how the plaque with the name of Vladimir Guerrero is already placed in Cooperstown. The Minister of Sports, Danilo Díaz; the Baseball Commissioner, Ricky Noboa; the President of the Olympic Committee, Luisín Mejía Ovideo, and the President of the Dominican Baseball League, Vitelio Mejía, led the official government delegation to the Hall of Fame ceremony. “We are here to support this historic moment that only three Dominicans have achieved: Don Juan Marichal, Don Pedro Martinez and Don Gregorio’s Storm, our Vladimir Guerrero,” said Díaz, who was impressed to watch the Angels’ supporters Guerrero shirts. “To see the Dominican Republic present through people who are not Dominicans and who carry the name of Vladimir on their back, who carry our flag, without a doubt makes us feel proud,” he added. The head of Dominican sport reiterated that the figure of Guerrero transcended much beyond his status as an athlete. “He was not only a great player, but an exemplary citizen, he is a good example for the rest of society,” he said. For his part, Noboa was proud to be present at such an important event for the trajectory and legacy of Dominican baseball. “For us it is truly a pride, it is a great satisfaction as a representative of the baseball testament of the Dominican state, of the Dominican government, to be here,” Noboa said. Guerrero’s entrance to the Hall of Fame comes at a special time to avoid the “frustration” of living in an era in which there were thought to be more Dominicans in the Hall, specifically with the names of Sammy Sosa and Manny Ramírez. However, suspicions of doping with Sosa and positive tests for prohibited substances Ramirez have so far damaged the candidacy of both. In a certain sense, the election of Guerrero has helped to alleviate that pain a little, that’s why today in Cooperstown his figure as a “unique” slugger shone more than ever. 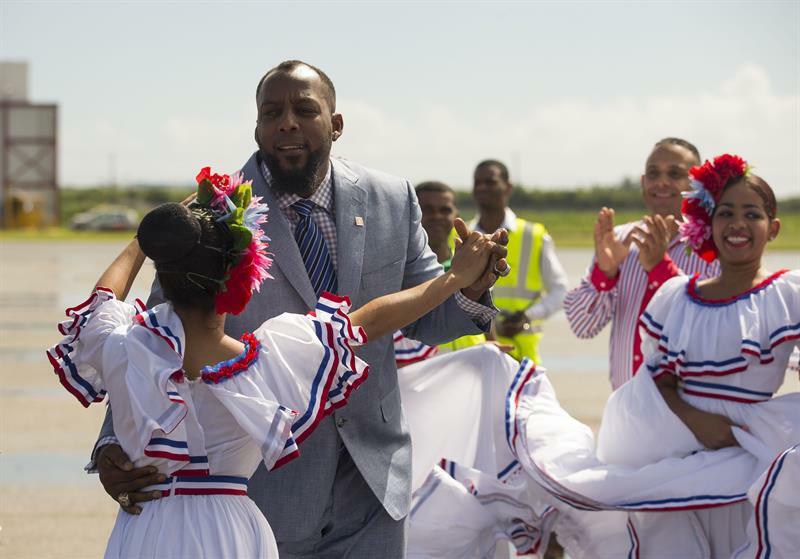 The Dominicans celebrated Sunday the exaltation of expeller Vladimir Guerrero to the Hall of Fame of American baseball, the third of this country to enter the niche of the immortals of Cooperstown. Since Guerrero spent his turn at the ceremony held in the State of New York, dozens of people went out to walk the streets of Don Gregorio, the small town where the extoletero was born, in the municipality of Nizao, Peravia province (south). “It’s amazing the joy we feel in this town for the elevation to the Hall of Fame of Vladimir, is our best ambassador in the world, not only for us, but for the entire country,” one of the people told local television. who participated in the enthusiastic parade. The atmosphere was festive in Don Gregorio, where Guerrero has lived all his life and whose streets often see him playing domino games or heading to a nearby property where he likes to plant fruit trees and raise animals. “Today the Hall of Fame of Cooperstown receives as our immortal our @ VladGuerrero.27 Dominican Republic celebrates with you this important milestone of your professional career Congratulations!” Wrote Dominican President Danilo Medina on his Twitter account. A big celebration party is being prepared tonight in the ex-gardener’s village, similar to when it was announced last January that he had been chosen by American baseball writers to enter Cooperstown. Among those who highlighted the greatness as a player of Guerrero and his humility inside and outside the diamond, were the ex-player and ex-manager Arturo de Freites, who signed the ‘slugger’, as well as the exlanzadores Francisco Cordero and Miguel Batista. The three recalled the “enormous capacity” that the batter had to set balls outside the strike zone, besides it was very difficult to make him fan. Guerrero, who spent 16 years in the Major Leagues, batted .318 average, fired 2,590 hits including 449 home runs, shoved 1,492 runs and possessed a cannon arm and covered ample space in the gardens. In 2004, he was elected the Most Valuable Player of the American League in the uniform of the Anaheim Angels, a team he distinguished by using his cap to write his name on the list of immortals of professional baseball in the United States. The former player was called nine times to the All-Star Game. The pitcher Juan Marichal, immortalized in 1983, and the ‘pitcher’ Pedro Martinez, in 2015, are the other two Dominicans in the Baseball Hall of Fame. Guerrero entered Cooperstwon today with Chipper Jones, Trevor Hoffman, Jim Thome, Jack Morris and Alan Trammell.